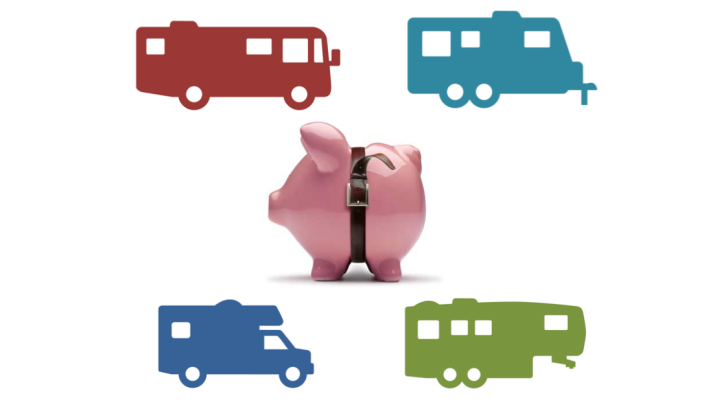 You might think you need a different wax product for each type of finish on the exterior of your RV, but you probably don't. RVs by their very nature spend a lot of time outdoors. 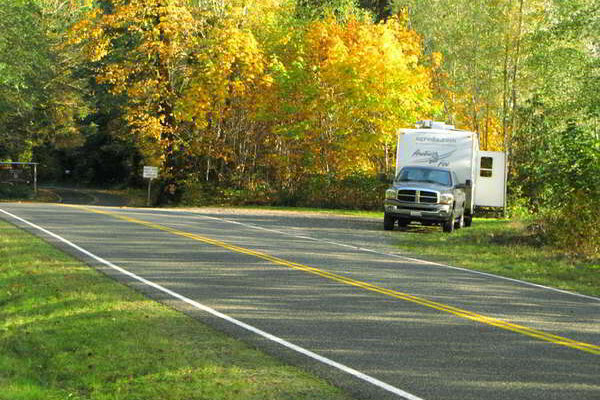 Sure you can store your RV in a fancy covered garage, but when it comes time to actually use it, you’ve got no other choice than to be out in Mother Nature. 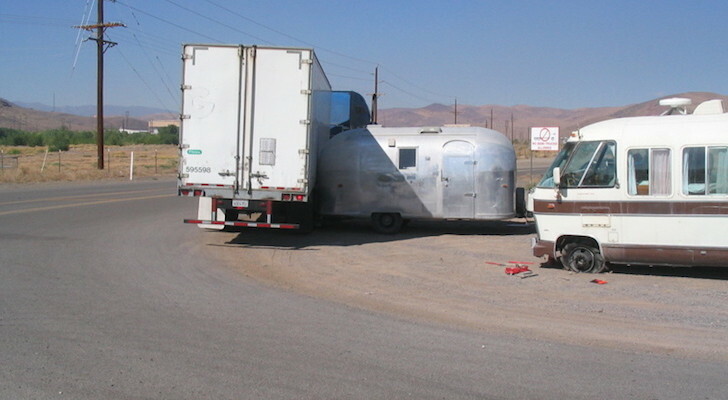 Over time, the exterior of your motorhome or trailer will show the effects of this exposure. 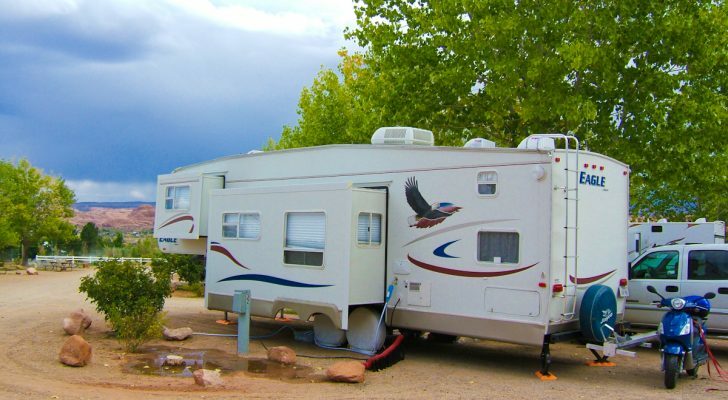 To bring back the natural luster of your RV’s paint job, you’ll need to thoroughly clean the exterior of your rig and apply a restorative wax. 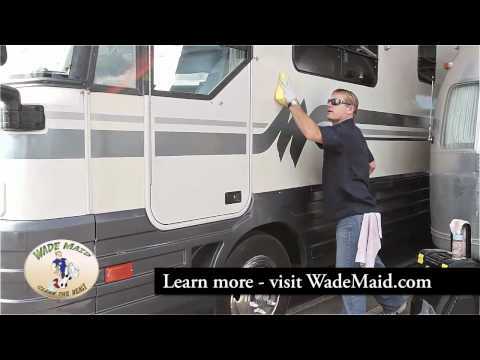 In this video, Wade from Wade Maid will show you how to use an RV wax to bring back the shine to your favorite vehicle. 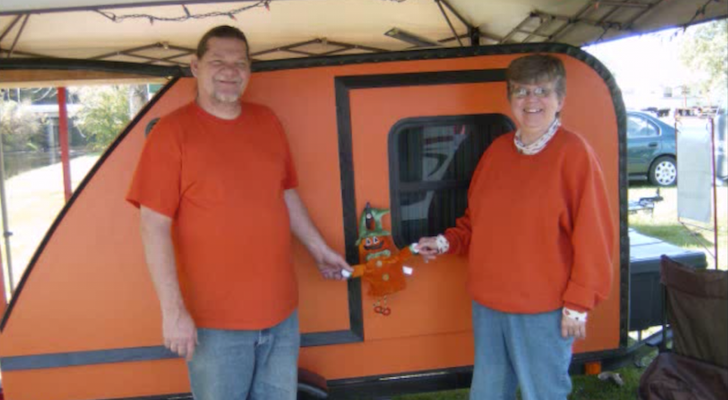 I’m going to show you the easy to do the once a year wax on your RV. 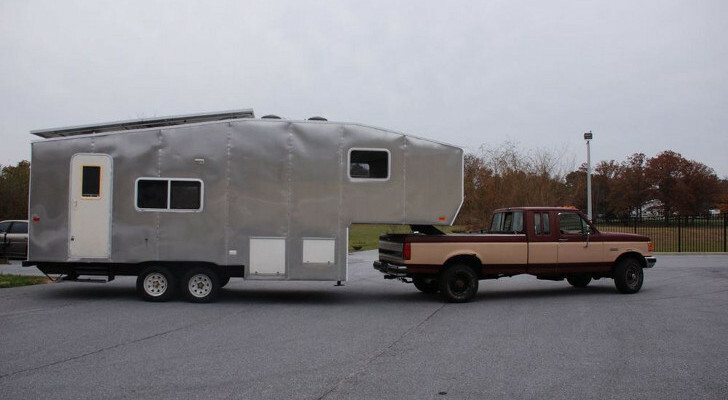 This is a 1994 Winnebago Vectra. What we have is we have a lacquer paint down here. Over here, baked on enamel because this is an aluminum door, and the fiberglass finish along with the vinyl striping. Now these have probably been replaced over time. This coach has also been rejuvenated, it’s been washed, rejuvenated, and is all prepped and ready for wax. Simply take your Wade Wax, make sure it’s shaken up all the way, because it will separate. Apply it to your large sponge. We don’t need a lot of product. And make sure your sponge is damp. We keep this sponges in a nice ziplock bag and ready to go, if you’ve seen our other videos or been to one of my seminars. I apply the product in a big circular motion. Then when you get down here, go with the grain, or go with the body panels. See how I’m just kind of working it around. We’re just sliding it right on there. Not a lot of rubbing, we’re just putting it on. I get up to the big areas, big circular motions, so I’m overlapping the area that I’m putting the wax on. Now on the fiberglass area we’re going to use a little more product because fiberglass tends to soak up, it’s quite absorbent. Take your towel, fold it in fours, I want you working with a flat surface. If you just bundle it all up like this, you don’t have as much area and you tend to miss spots because you have a wad. Let’s fold it like this, let the product dry, it’s going to take a couple seconds here. Now that the couple has dried to a light haze, what that is telling you, is that it has soaked up the wax. And that’s what we want. What’s left on the outside is a chalk, which is the same agent that we used to carry the product and to help polish it. We’ll simply start taking it off, and fold your towel, flip your towel over, take it off until it’s nice and shiny and smooth. And your eyes will tell you what you’re working with. I like to do this with sunglasses, because it helps you see what you have. Notice how I’m folding the towel, you can go like this, or like that, look at an angle. The shine is what we’re looking for here, and that’s how we avoid missing spots. This product is designed to be easy to use and wipe off. I mean look at that, we’re done with this big section. This is probably a five foot area that I’ve done in relatively short time. 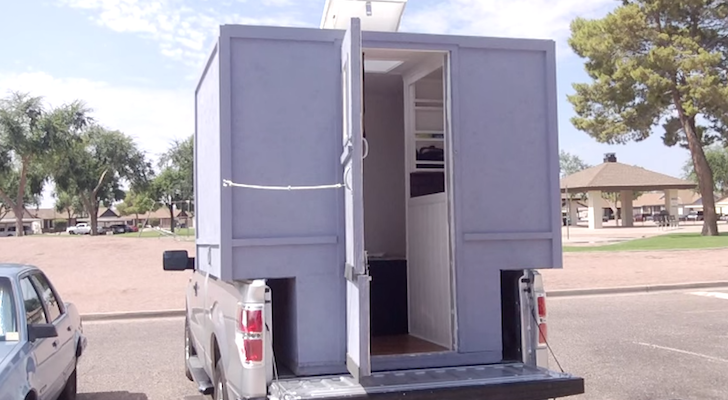 So to summarize we just easily waxed four different materials, lacquer paint like you’d have on a car, we did an aluminum door, which is a backed on enamel, vinyl stripe, and a fiberglass type finish. Alright, we started with a damp sponge and very little Wade Wax on it, does not take a lot of product. 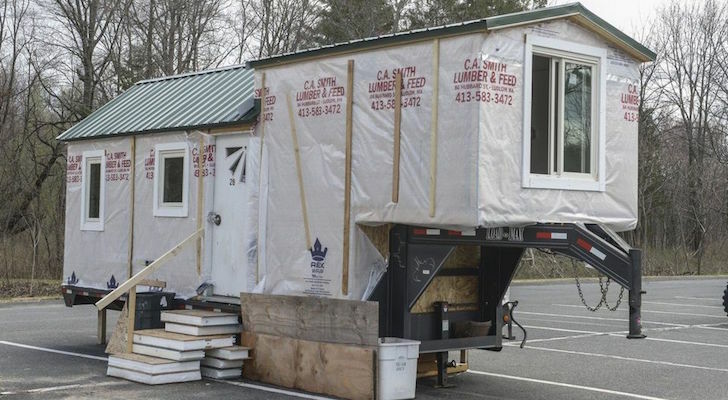 But we used a little more product and pushed a little heavier on the fiberglass portion of the coach. We let it dry to a haze, and simply wiped it off, and polished it to a shine.